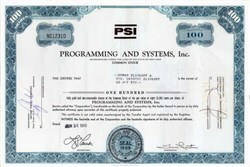 Beautifully engraved certificate from the Programming and Systems, Inc. issued in 1968-1991. This historic document was printed by the American Banknote Company and has an ornate border around it with a vignette of the company's initals. This item has the printed signatures of the Company’s President (Irwin Mautner)and Secretary and is over 10 years old. On June 18, 1992, the Securities and Exchange Commission suspended trading of the common stock of Programming and Systems, Inc., because of information received questioning the accuracy of the Company's financial statements. Following the release of this information, the Company's common stock was delisted by NASDAQ. Irwin Mautner, 63, of Greenwich, was indicted in August in a scheme to defraud the U.S. Department of Education by concealing the high rate of student withdrawals at New York-based Programming and Systems Inc. The scheme was designed to prevent the schools from losing their accreditation, and consequently, their eligibility to receive the federal loans and grants. From July 1988 through September 1993, PSI schools received federally insured student loans totaling more than $100 million and federal Pell Grant funds totaling more than $41 million, the indictment said. Since more than half PSI's students dropped out or failed, the true rate would have disqualified the schools for federal grants and loans, prosecutors said. ``He was continuing to draw down the money for those students even though they were withdrawing, and that's where the fraud comes in,'' said Rodger Murphey, a spokesman for the Education Department. PSI was a publicly traded corporation, which at one time had more than 3.6 million shares of stock outstanding and annual revenues in excess of $31 million. Mautner had previously consented in December 1994 to civil penalties imposed by the Securities and Exchange Commission in connection with false financial statements submitted to the commission..
Mautner pleaded guilty in U.S. District Court in Akron, Ohio, Tuesday to charges of mail fraud, conspiracy to defraud the Education Department and making a false statement. Each violation carries a maximum penalty of five years in prison and/or a $250,000 fine. PSI operated 11 vocational schools in the following cities: Baltimore; Charlotte, N.C., Cleveland; Columbus, Ohio; Flint, Mich.; Indianapolis; Miami; New York; Philadelphia; Southfield, Mich.; and Washington, D.C. The schools closed in 1992 and 1993. In a plea agreement with the government, PSI National Financial Aid Director Ronald Sundick, of Roslyn, N.Y., pleaded guilty Nov. 14 to obstructing a federal audit. Mautner and Sundick are scheduled to be sentenced early next year.